End Boom Sheeting | Canadian SeaSpray Assn. The stock sheeting system for the mainsail is another area for improvement. The end boom sheeting system as used on the Laser is the system we recommend. Chain plates are attached to the transoms of each hull and a cleat on the center boom which will allow a traveller system along with a ‘laser’ type end of boom mainsheet system. 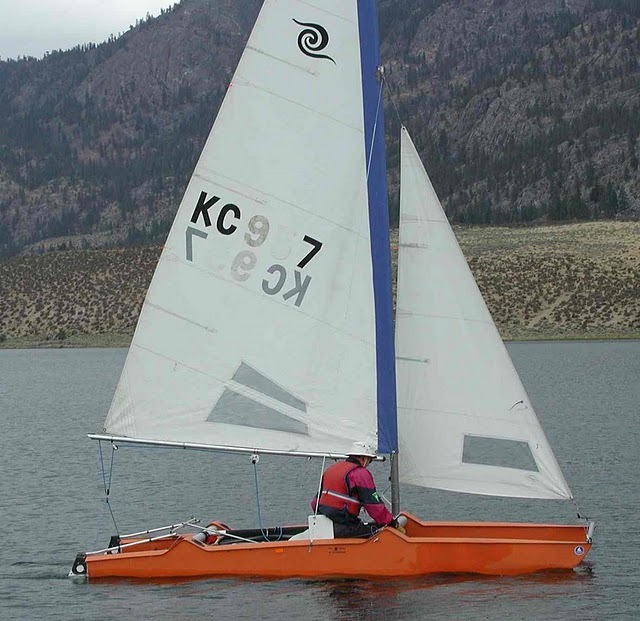 The main difference is the use of a pivoting exit block on the boom with a cleat (check the Harken catalogue and get the lighter one suitable for 5/16″ rope). Proper positioning of this exit block is necessary to allow easy release of the mainsheet from the cleat. This system I feel is much better than passing the tiller stick around the standard system mainsheet block.